The serum ferritin assay is the best single blood test for the diagnosis of iron deficiency. Previous studies with elderly anemic patients have suggested that ferritin level less than 45 μg/L is indicative of iron deficiency. The subjects of these studies were hospitalized patients with anemia, however. We thus conducted a prospective study to determine the normal minimum level of serum ferritin of community-dwelling older adults by assessing the ratio of serum transferrin receptor to the log ferritin level (sTfR-F index). We conducted the anemia survey between October and November 2002. A total of 1,254 apparently healthy older adults, aged between 60 and 95 years, from three urban community dwellings participated in the survey. Among these individuals, 156 subjects who were anemic or whose serum ferritin level was less than 100 μg/L were selected. The soluble transferrin receptor assay was performed and the sTfR-F index was calculated. The receiver operating characteristic curve analysis was performed. 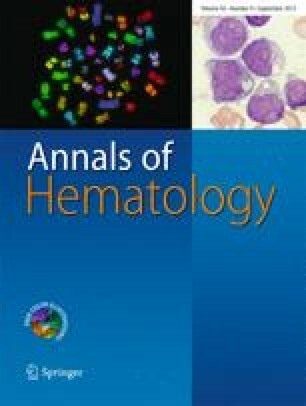 Based on the data, serum ferritin level of 22 μg/L was selected as the cutoff value for the diagnosis of iron deficiency in community-dwelling older adults. Applying the serum ferritin cutoff of 22 μg/L and the sTfR-F index cutoff of 1.5, the sensitivity of the assay was 89.5% (34 of 38) and the specificity was 89.0% (105 of 118). In conclusion, for the diagnosis of iron deficiency of community-residing older adults, we suggest the serum ferritin cutoff value of 22 μg/L obtained by use of the sTfR-F index. The value is lower than the previous value established for hospitalized and anemic older adults. This study was supported by the Brain Korea 21 Project in 2003. The corresponding author (J. Lee)’s research was supported by the grant from the Medical Research Center for Environmental Toxicogenomics and Proteomics, funded by Korea Science and Engeneering Foundations and Ministry of Science and Technology.